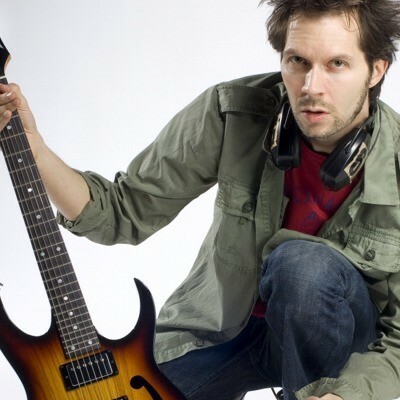 Since the reformation of Mr Big, guitar master Paul Gilbert hadn't been in the UK on a solo tour, so now that the band are currently not busy, it was the perfect timing for Gilbert to visit and indulge his personal fans. On this occasion, it was on his latest solo studio effort, 'Vibrato' that the first half of the set heavily relied on, and tracks such as 'Bivalve Blues', 'Atmosphere On The Moon' and 'The Pronghorn' were showcased live with the exact same musicians that recorded the album, namely Paul's wife Emi on keyboards, and the renowned Thomas Lang on drums and Kelly LeMieux on bass. What a band! And to spoil the very busy venue, they played the mind-blowing 'Technical Difficulties' from Racer X, the group that brought Gilbert to fame. If on his last solo visit I highlighted the large proportion of covers the American guitaritst performed, this time around there were surprisingly even more. From Chicago's '25 Or 6 To 4' (which he admitted was the first song he learned on guitar), Rainbow's 'Man On The Silver Mountain', The Police's 'Synchronicity I' and Deep Purple's 'Space Truckin'' to The Faces' 'Stay With Me' and a wonderful tribute to the late Gary Moore with 'Still Got The Blues', not forgetting AC/DC's 'Sin City', for which they all changed instruments (Paul on drums, Emi on vocals, Thomas on bass and Kelly on guitar) and 'Beating Around The Bush', with which they finished the delightfully extensive evening. Naturally, Mr Big had to be showcased in some form or shape, and on this tour Gilbert opted to offer a one-man medley comprising solo tracks such as 'Alligator Farm' and 'Space Ship One' as well as Mr Big's 'To Be With You' and 'Green Tinted-Sixties Mind', for which the rest of the band joined him back on stage. More of his solo back catalogue followed later with the contagious 'Down To Mexico'. From start to finish it was clear Mr Gilbert was having a blast (and so were we), and despite the fact that his vocal abilities cannot in any way be compared to his colleague Eric Martin's (whom I had the pleasure to see live in Rome a mere few days later), and the show, in my humble opinion, had too many keyboards, he can be excused for he is a phenomenal guitar player with a bunch of amazing songs, and, let's face it, the majority of the audience were, as usual, mainly guitar students and musos. Once again, Paul Gilbert blew minds away.